What Does FPIES Stand For? 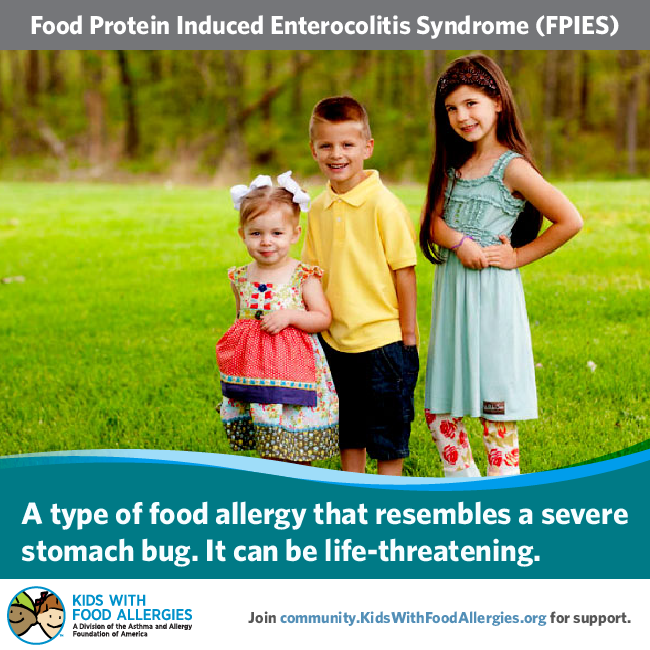 FPIES is Food Protein-Induced Enterocolitis Syndrome. It is commonly pronounced "F-Pies", as in "apple pies", though some physicians may refer to it as FIES (pronounced "fees", considering food-protein as one word). Enterocolitis is inflammation involving both the small intestine and the colon (large intestine). FPIES is a non-IgE mediated immune reaction in the gastrointestinal system to one or more specific foods, commonly characterized by profuse vomiting and diarrhea. FPIES is presumed to be cell mediated. Poor growth may occur with continual ingestion. Upon removing the problem food(s), all FPIES symptoms subside. (Note: Having FPIES does not preclude one from having other allergies/intolerances with the food.) The most common FPIES triggers are cow's milk (dairy) and soy. However, any food can cause an FPIES reaction, even those not commonly considered allergens, such as rice, oat and barley. A child with FPIES may experience what appears to be a severe stomach bug, but the "bug" only starts a couple hours after the offending food is given. Many FPIES parents have rushed their children to the ER, limp from extreme, repeated projectile vomiting, only to be told, "It's the stomach flu." However, the next time they feed their children the same solids, the dramatic symptoms return. What Does IgE vs Cell Mediated Mean? IgE stands for Immunoglobulin E. It is a type of antibody, formed to protect the body from infection, that functions in allergic reactions. IgE-mediated reactions are considered immediate hypersensitivity immune system reactions, while cell mediated reactions are considered delayed hypersensitivity. Antibodies are not involved in cell mediated reactions. For the purpose of understanding FPIES, you can disregard all you know about IgE-mediated reactions. When Do FPIES Reactions Occur? FPIES reactions often show up in the first weeks or months of life, or at an older age for the exclusively breastfed child. Reactions usually occur upon introducing first solid foods, such as infant cereals or formulas, which are typically made with dairy or soy. (Infant formulas are considered solids for FPIES purposes.) While a child may have allergies and intolerances to food proteins they are exposed to through breastmilk, FPIES reactions usually don't occur from breastmilk, regardless of the mother's diet. An FPIES reaction typically takes place when the child has directly ingested the trigger food(s). What is a Typical FPIES Reaction? As with all things, each child is different, and the range, severity and duration of symptoms may vary from reaction to reaction. Unlike traditional IgE-mediated allergies, FPIES reactions do not manifest with itching, hives, swelling, coughing or wheezing, etc. Symptoms typically only involve the gastrointestinal system, and other body organs are not involved. FPIES reactions almost always begin with delayed onset vomiting (usually two hours after ingestion, sometimes as late as eight hours after). Symptoms can range from mild (an increase in reflux and several days of runny stools) to life threatening (shock). In severe cases, after repeatedly vomiting, children often begin vomiting bile. Commonly, diarrhea follows and can last up to several days. In the worst reactions (about 20% of the time), the child has such severe vomiting and diarrhea that s/he rapidly becomes seriously dehydrated and may go into shock. What is Shock and What are the Symptoms? Shock is a life-threatening condition. Shock may develop as the result of sudden illness, injury, or bleeding. When the body cannot get enough blood to the vital organs, it goes into shock. Extreme thirst, nausea, or vomiting. How Do You Treat an FPIES Reaction? Always follow your doctor's emergency plan pertaining to your specific situation. Rapid dehydration and shock are medical emergencies. If your child is experiencing symptoms of FPIES or shock, immediately contact your local emergency services (9-1-1). If you are uncertain if your child is in need of emergency services, contact 9-1-1 or your physician for guidance. The most critical treatment during an FPIES reaction is intravenous (IV) fluids, because of the risk and prevalence of dehydration. Children experiencing more severe symptoms may also need steroids and in-hospital monitoring. Mild reactions may be able to be treated at home with oral electrolyte re-hydration (e.g., Pedialyte®). Not usually, because epinephrine reverses IgE-mediated symptoms, and FPIES is not IgE-mediated. Based on the patient's history, some doctors might prescribe epinephrine to reverse specific symptoms of shock (e.g., low blood pressure). However, this is only prescribed in specific cases. What are Some Common FPIES Triggers? The most common FPIES triggers are traditional first foods, such as dairy and soy. Other common triggers are rice, oat, barley, green beans, peas, sweet potatoes, squash, chicken and turkey. A reaction to one common food does not mean that all of the common foods will be an issue, but patients are often advised to proceed with caution with those foods. Note that while the above foods are the most prevalent, they are not exclusive triggers. Any food has the potential to trigger an FPIES reaction. Even trace amounts can cause a reaction. FPIES is difficult to diagnose, unless the reaction has happened more than once, as it is diagnosed by symptom presentation. Typically, foods that trigger FPIES reactions are negative with standard skin and blood allergy tests (SPT, RAST) because they look for IgE-mediated responses. However, as stated before, FPIES is not IgE-mediated. Atopy patch testing (APT) is being studied for its effectiveness in diagnosing FPIES, as well as predicting if the problem food is no longer a trigger. Thus, the outcome of APT may determine if the child is a potential candidate for an oral food challenge (OFC). APT involves placing the trigger food in a metal cap, which is left on the skin for 48 hours. The skin is then watched for symptoms in the following days after removal. Please consult your child's doctor to discuss if APT is indicated in your situation. How Do You Care for a Child With FPIES? Treatment varies, depending on the patient and his/her specific reactions. Often, infants who have reacted to both dairy and soy formulas will be placed on hypoallergenic or elemental formula. Some children do well breastfeeding. Other children who have fewer triggers may just strictly avoid the offending food(s). New foods are usually introduced very slowly, one food at a time, for an extended period of time per food. Some doctors recommend trialing a single food for up to three weeks before introducing another. Because it's a rare, but serious condition, in the event of an emergency, it is vital to get the correct treatment. Some doctors provide their patients with a letter containing a brief description of FPIES and its proper treatment. In the event of a reaction, this letter can be taken to the ER with the child. Is FPIES A Lifelong Condition? Typically, no. Many children outgrow FPIES by about age three. Note, however, that the time varies per individual and the offending food, so statistics are a guide, but not an absolute. In one study, 100% of children with FPIES reactions to barley had outgrown and were tolerating barley by age three. However, only 40% of those with FPIES to rice, and 60% to dairy tolerated it by the same age. How Do I know If My Child Has Outgrown FPIES? Together with your child's doctor, you should determine if/when it is likely that your child may have outgrown any triggers. Obviously, determining if a child has outgrown a trigger is something that needs to be evaluated on a food-by-food basis. As stated earlier, APT testing may be an option to assess oral challenge readiness. Another factor for you and your doctor to consider is if your child would physically be able to handle a possible failed challenge. When the time comes to orally challenge an FPIES trigger, most doctors familiar with FPIES will want to schedule an in-office food challenge. Some doctors (especially those not practicing in a hospital clinic setting) may choose to challenge in the hospital, with an IV already in place, in case of emergency. Each doctor may have his or her own protocol, but an FPIES trigger is something you should definitely NOT challenge without discussing thoroughly with your doctor. Be aware that if a child passes the in-office portion of the challenge, it does not mean this food is automatically guaranteed "safe." If a child's delay in reaction is fairly short, a child may fail an FPIES food challenge while still at the office/hospital. For those with longer reaction times, it may not be until later that day that symptoms manifest. Some may react up to three days later. Delay times may vary by food as well. If a child has FPIES to multiple foods, one food may trigger symptoms within four hours; a different food may not trigger symptoms until six or eight hours after ingestion. How is FPIES Different From MSPI, MSPIES, MPIES, Etc.? MPIES (milk-protein induced enterocolitis syndrome) is FPIES to cow's milk only. MSPIES (milk- and soy-protein induced enterocolitis syndrome) is FPIES to milk and soy. Some doctors do create these subdivisions, while others declare that milk and soy are simply the two most common FPIES triggers and give the diagnosis of "FPIES to milk and/or soy." MSPI is milk and soy protein intolerance. Symptoms are those of allergic colitis and can include colic, vomiting, diarrhea and blood in stools. These reactions are not as severe or immediate as an FPIES reaction. Fogg MI, Brown-Whitehorn TA, Pawlowski NA, Spergel JM. (2006). Atopy Patch Test for the Diagnosis of Food Protein-Induced Enterocolitis Syndrome. Pediatric Allergy and Immunology 17: 351–355. Retrieved on December 31, 2007 from http://pediatrics.aappublications.org/cgi/content/abstract/120/Supplement_3/S116. Burks, AW. (2006). Don't Feed Her That! Diagnosing and Managing Pediatric Food Allergy. Pediatric Basics. Gerber Products Company: 115. Retrieved on December 31, 2007 from http://www.gerber.com/content/usa/html/pages/pediatricbasics/articles/115_01-dontfeed.html. Moore, D. Food Protein-Induced Enterocolitis Syndrome. (2007, April 11). Retrieved on December 31, 2007 from http://allergies.about.com/od/foodallergies/a/fpies.htm. Sicherer, SH. (2005). Food Protein-Induced Enterocolitis Syndrome: Case Presentations and Management Lessons. Journal of Allergy and Clinical Immunology Vol. 115, 1:149-156. Retrieved on December 31, 2007 from http://www.jacionline.org/article/PIIS0091674904024881/fulltext. Nowak-Wegrzyn, A., Sampson, HA, Wood, RA, Sicherer, SH. MD, Robert A. Wood, MD and Scott H. Sicherer, MD. (2003). Food Protein-Induced Enterocolitis Syndrome Caused by Solid Food Proteins. Pediatrics. Vol. 111. 4: 829-835. Retrieved on December 31, 2007 from http://pediatrics.aappublications.org/cgi/content/full/111/4/829#T1. Nocerino, A., Guandalini, S. (2006, April 11). Protein Intolerance. Retrieved on December 31, 2007 from http://www.emedicine.com/ped/topic1908.htm. WebMD Medical Reference from Healthwise. (2006, May 31). Shock, Topic Overview. Retrieved on December 31, 2007 from http://www.webmd.com/a-to-z-guides/shock-topic-overview. American Academy of Allergy, Asthma and Immunology. (2007). Tips to Remember: What is an Allergic Reaction? Retrieved on December 31, 2007 from http://www.aaaai.org/patients/publicedmat/tips/whatisallergicreaction.stm. Sicherer, SH. (2006). Understanding and Managing Your Child's Food Allergies. A Johns Hopkins Press Health Book. 336.